The campsite is situated in the heart of the region of Morcenais which has an abundance of museums, churches, vast gardens and wildlife and it is surrounded by beautiful landscapes - a pleasure for young and old. Not to forget: its forest is the biggest in Europe. Allow yourself to be charmed by this environment, bordered with waterways, scented by pine trees … only a few minutes from the coast of the region The Landes – simply a dream. Numerous museums and natural sites to gaze at … here the castle of Gaujacq - about 45 minutes by car from the campsite. It is a lord’s manor from the 17th century and it presents an original and unusual architecture which is organized around an interior garden which itself is surrounded by an Italian style gallery. This estate and its plantarium welcome you on the guided tours. Apart from that, there are other places to visit like the ‘Conservatoire de la lutte contre le feu’ (firefighting museum) or the ‘Ecomusée de l’Armanac’ (folk museum of Armanac). These sites will give you the opportunity to discover the region The Landes in a different way by focusing on the culture and the way of life here. While visiting the plantariums, the botanic gardens or while walking in the parks, as for example at the ‘Moulin de Galoppe’ (Galoppe’s Mill), you can also relax. For the little ones, there are plenty of farms and zoos, among which is a magnificent one with beautiful butterflies. Not far from the pine trees and the foliage: the sea. 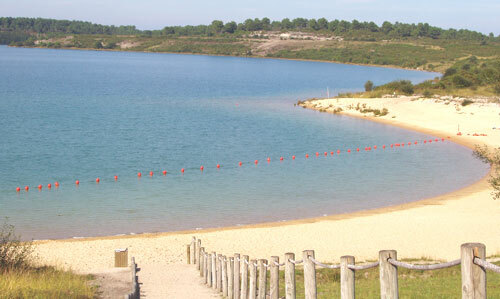 The coastline of The Landes offers you numerous activities. You can take the ‘Bâteau de Jean B’ (the boat of Jean B) to go on a little tour or even go fishing in the sea. From the ‘Ecomusée de la mer’ (sea museum) you have an exceptional panoramic view of the sea. Furthermore, there are incredible aquariums with sea water, you can learn about the history of fishing, marvel at collections of shell fish … sea lovers will certainly be happy. If you want to feel like a sailor, follow the temptation of the adventure at the mini port, a good occasion to share some unforgettable moments with your family. Obviously, The Landes don’t lack resources and traditions, as for example the Game of Quilles – probably the ancestor of bowling – or the bullfight of The Landes, which attracts a great number of amateurs. You need to know that the people in The Landes know how to enjoy life and they are always ready to have a party. Don’t forget to taste the delicious specialties of the region, like Foie Gras (goose liver), the good poultry, the Chalosse beef and other local dishes. You should also try the wines of Armagnac. Luckily for the guests of our campsite, the restaurant ‘Chez Maïté’ is only a few kilometres away. So, don’t miss it. A settlement of the Grande Lande in the 19th century … At that time, along the banks of little streams, far away from the humid plateaus and sometimes outside of small towns, the inhabitants of the settlements of the Grande Lande were essentially shepherds and ploughmen. The folk museum is an outdoor museum which was faithfully restored and rebuilt – the buildings, the field and the milling area, the gardens and shady clearings in the heart of the forest, a flock of sheep and oxen at work - the most characteristic elements of the agro-pastoral society of the Grande Lande. As the seasons go by, visitors have the opportunity to get to know the important periods and celebrations, such as harvest, ‘la bugade’ (a traditional party of washing clothes) or sheep shearing. By taking the train with its hundred-year old cars, you can reach this historic site where you have the possibility to learn about the life of the former habitants of ‘The Landes’. Once you have arrived in Marquèze, you can eat in the restaurant or have a snack in the picnic area ‘Le cercle’. The restaurant offers you regional specialties and the latter has an open-air service (July and August every day). You will certainly meet enthusiasts who invite you to have a ‘conference’ walk around several different themes, like the forest through literature or the Gascon language … in order to share the life as well as the history of this region.